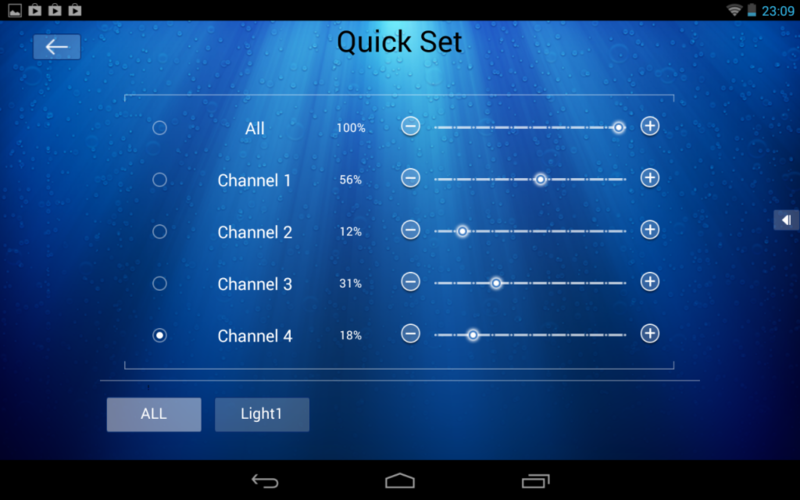 In this video we demonstrate our Orphek Atlantik V2 Wireless Quick Set. This unit can be controlled by tablet and mobile phone and it responds quickly as shown in the video. Once you enter to Quick set screen you will see at the bottom of the screen 2 buttons displayed: ALL and Light 1. ALL button sets ALL ATLANTIK UNITS. Light 1 button sets ONLY THIS UNIT. You will also find 5 options for programming your Atlantik unit: ALL and 4 CHANNELS (1,2,3,4). ALL button displayed on top left of the screen is used to set ALL CHANNELS. Channels (1,2,3,4) buttons set EACH of these channels. In the center of the screen you will find the intensity of light percentage field (from 0 to 100%) and on the right side the -/+ scale to set this percentage according to your desire. Click on the ALL button in the bottom of the screen to choose to set all units or on LIGHT 1 button to choose just this unit.Click on the “o” button for ALL option displayed on the list of channel options if you wish to set all four channels, or choose which channel(s) (1,2,3,4) you wish to program by clicking on the “o” button of each channel. Option one: Touch the “o” button and move it from left to right to increase percentage (increase intensity). Touch the “o” button and move it from right to left to decrease percentage (decrease intensity). Option two for fine-tuning: Touch the (+) button on the right to increase percentage (increase intensity). Touch the (-) button on the left to decrease percentage (decrease intensity).